Shrimp plant gets its common name from the arching 3- to 4-inch spikes of overlapping bracts that cover this plant nearly year-round. The showy bracts range from reddish-brown to coppery pink to golden yellow. You'll get the best color by providing plenty of light. Keep the plant in a bright location where it will get some direct sun. 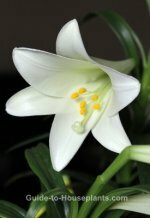 Small, white flowers that appear at the end of the bracts are insignificant and last only a short time. Pinch your plant. Pinch off the growing tips often to encourage branching. You'll be rewarded with a much nicer-looking plant that is compact and bushy. If you want, you can propagate the stem tip cuttings for more plants. This shrubby perennial will last for several years. Its upright, woody stems are covered with velvety, evergreen foliage. The pointed, oval leaves are about 1-3 in (2.5-8 cm) long. It'll get tall and leggy if not pruned back regularly. If you don't prune it, you may need to stake its weak branches. Regular pruning is needed to control its growth and to prevent it from becoming leggy. Prune it back hard in early spring -- by half when necessary. Repot in spring when it has outgrown its pot. You can repot and prune at the same time, you won't hurt this plant at all. 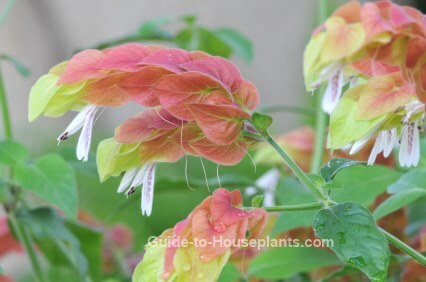 You may find this plant classified as either Justicia brandegeana or Beloperone guttata. Cultivars are available with yellow, salmon or brick-red bracts. J. brandegeana 'Yellow Queen' has yellow bracts. 'Fruit Cocktail' has yellow and green bracts with pink flowers. You may be able to find Shrimp Plant at garden centers, if you live in a region that is warm year-round. Or look for it at online nurseries. Height: Up to 3 ft (90 cm) if not pruned back. Light: Shrimp Plant needs plenty of light to bloom. Give it bright light with as much direct sun as possible. Water: Water thoroughly, allowing the soil to dry out almost completely before watering again. Yellow leaves are caused by overwatering. Always use a pot with a drainage hole to prevent soggy soil. Water less in winter. Humidity: Average room humidity (around 40% relative humidity). If air is dry, using a room humidifier is the most efficient way to increase moisture. Temperature: Average room temperatures 65-75°F/18-24°C. You can move it out to the patio for the summer, if you want. Bring it back in if the temperature drops...it will tolerate a minimum of 60°F/16°C. Soil: All-purpose houseplant potting mix. Fertilizer: Feed every 2 weeks year-round with a high-phosphorus liquid fertilizer diluted by half. Propagation: Take 4 in (10 cm) stem tip cuttings in spring. Remove the flower bracts from the stem and insert in moist potting medium.